Ellen Lawless Ternan was the daughter of the actors Thomas Ternan and Frances Jarman. She was known as Nelly. She appeared on the stage when she was only ages three. Allthough she was considered to be less talented than her sisters Maria and Frances she caught the eye of Charles Dickens when she was performing at the Haymarket Theatre in London in 1857. Together with her mother and her sister Maria he asked her to appear with his amateur company in "The Frozen Deep" by Wilkie Collins. She started a secret affair with Dickens who was forty-five at the time. She was young, clever and interested in literature, theatre and politics and this made her far more attractive to Dickens than his wife Catherine. In 1858 Catherine accidentally received a bracelet that was meant for Nelly. Dickens left his wife and continued his affair with Nelly. In 1860 she left the stage and Dickens supported her financially. Sometimes she travelled with him, but in 1867 he didn't take her with him to the USA because he feared the American press. She lived at houses in Slough and Nunhead that he rented for her. When Dickens suddenly died in 1870 left her £1,000 and an income from a trust fund. In 1876 she married Oxford graduate Geroge Wharton Robinson, who was twelve years younger than she was. But she subtracted ten years from her own age and he never found out about her time with Dickens. They had a son, Geoffrey, and a daughter, Gladys. Together they ran a boys' school in Margate. During the last years of her life she lived in Southsea, Portsmouth, where by that time the house where Dickens was born was turned into a museum. Wharton Robinson died in 1907 and Nelly in 1914. 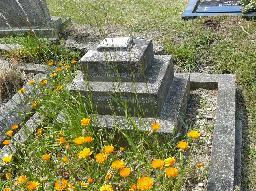 They were buried at Highland Road Cemetery in Southsea. Only after her death her son Geoffrey found out that his mother had been an actress and had known Charles Dickens. 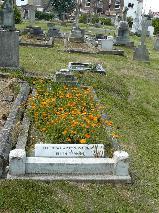 The grave of Ellen Ternan at Highland Road Cemetery, Portsmouth.